Everyone agrees that homelessness in the metro area is worsening, but consensus on a solution is difficult to achieve. Fortunately, the Metropolitan Alliance for Common Good Clackamas Housing Team is offering a solution of its own: hosting faith-based transitional shelters. For the past two years, the members of the MACG Clackamas Housing Team have been working with Clackamas County employees and interested community partners to create a pilot program that will provide safety and shelter for the unhoused. Now the team is promoting an opportunity conceived by Clackamas County government after the Board of County Commissioners declared a housing emergency. 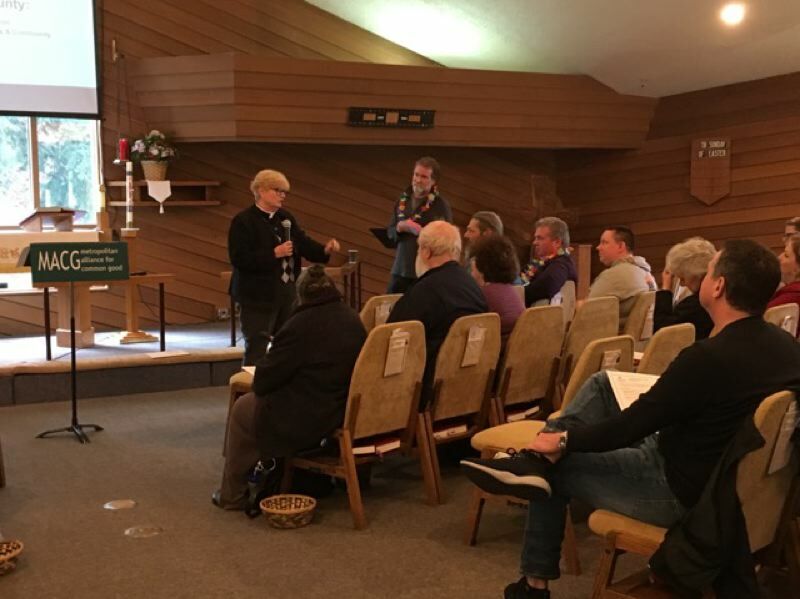 There are two prongs to the commissioners' plan — a tiny-house community for veterans, and a chance for churches in unincorporated Clackamas County to provide Safe Overnight Shelter on their property for the homeless, said Mary Zellharie, co-chair of the Clackamas housing team with Pastor Craig Johnson of Christ Lutheran in Aurora. 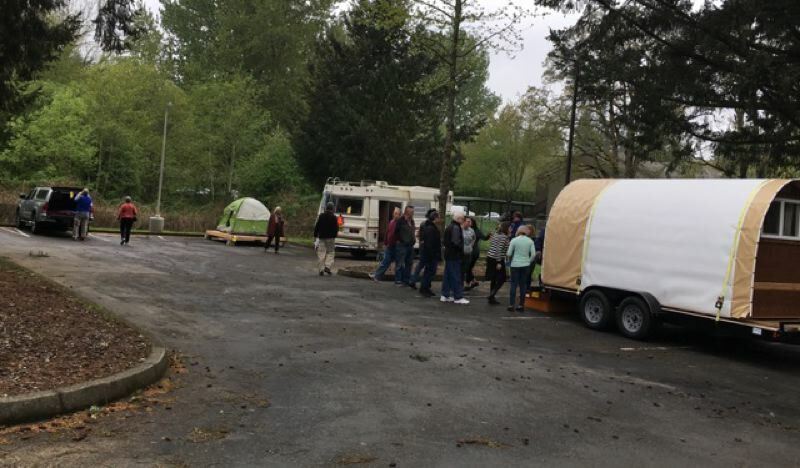 The housing team sponsored a Safe Overnight Shelter Open House on April 28 at Prince of Life Lutheran Church in Oregon City. Over 60 people representing churches, county officials and service agencies attended the event. Topics of discussion at the event included understanding houselessness in Clackamas County, transforming parking lot ministries, and navigating the SOS model. The purpose of Save Overnight Shelter is to provide a safe place where homeless people may sleep in their car, an RV, a tent, or a Conestoga hut. Interested churches apply and then the county and MACG will walk the congregations through the process, Zellharie said. In addition to housing team co-chair Johnson, speakers included Pastor John Reuter-Harrah from Prince of Life; the Rev. Nancy Gallagher from St. John the Divine in Springfield, who talked about hosting eight homeless people on the grounds of her church; and David England, one of the eight who lives in a hut on church property. There are over 100 churches in unincorporated Clackamas County, and they were all invited, along with some other churches in the county as well city officials. "We wished that more churches were able to send someone to attend, but we were very happy with the gathering. There was lots of good sharing of ideas," Zellharie said. "The speakers did an outstanding job of explaining the background of houselessness: what it's like to house people on church property, and the process for applying and getting ready to assist houseless neighbors. "This was a first step — and as churches can see how the program might work, we are confident that others will step forward," Zellharie added. Nonprofit service providers in the community also attended the open house, including Elspeth Tanguay-Koo, a co-leader at HOMEpdx, and Vahid Brown, homeless policy coordinator for Clackamas County Health, Housing and Human Services. Zellharie said they are committed to helping clients access Safe Overnight Shelters and will help them with social services needs so they can transition to an apartment or home when ready. The next step for the Clackamas housing team is to look at comment cards left by open house attendees and determine how to answer questions raised. "We'll reach out to those who didn't attend and share the SOS plan with them. We'll work with the cities in the county to help with their zoning so they can offer their plan to churches in their cities," Zellharie said. For those who wondered about the benefits of Conestoga huts over tiny houses or tents, Zellharie noted that the wagons are cheaper and more portable than a traditional tiny house. "They have a door that can be locked, a window and a small heating device that can be used safely," she said. She also noted that each church will decide what sanitary facilities will be available to the guests housed on the property. "There will be a port-a-potty and water, and if a church has showers, they may offer use. Working with the county, the church will devise a plan that is appropriate for their situation," Zellharie said. For information about HOMEpdx, visithomepdx.net. For information about Health, Housing, and Human Services - Clackamas County, visit clackamas.us/h3s.